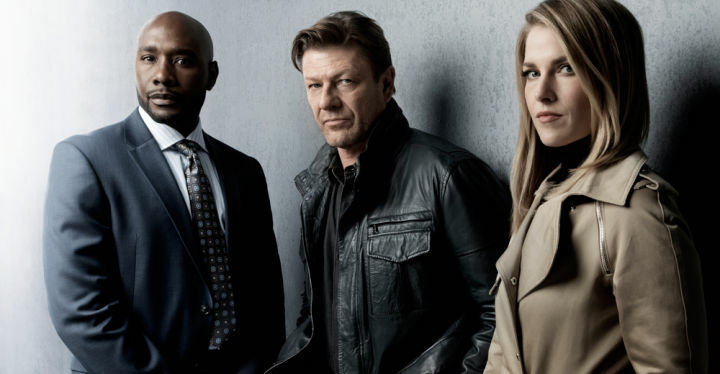 An undercover agent is plunged into a terrifying mystery over his own identity in TNT's new drama series "Legends," starring Sean Bean and Ali Larter. Based on the award-winning book by master spy novelist Robert Littell, "Legends" is the story of Martin Odum (Bean), an undercover agent working for the FBI's Deep Cover Operations (DCO) division, who has the uncanny ability to transform himself into a completely different person for each job. In the premiere episode, Martin returns to the FBI after an assignment infiltrating the Citizen�s Army of Virginia (CAV), a domestic terrorist organization. He tries to re-connect with his estranged wife and son, put his life back together and get the last "legend" behind him, but when the CAV announces an eminent attack, Martin must go back under in order to stop them. The Premise: "Legends" is a show about a special group of FBI agents who handle covert investigations. A legend is an identity that is created by an undercover agent to go undercover and infiltrate, but it's actually a fully, deeply imagined life. Martin Odum is allegedly the best of the best. But he is also a guy who can't tell his legends from his real life. The Characters: Martin Odum, if that is his real name, is an FBI agent who works legends, who works undercover. He does deep-cover infiltration. In the pilot, a dying man says to him, "Martin Odum is a legend. It's not who you really are" This launches Martin on a quest to discover what may actually be happening in his life and who he really is. If there is a grand conspiracy afoot behind this, he's going to get to the bottom of it. In the division of DOC, which is an elite division in the FBI, Martin's handler, the person who runs his operations is Special Agent Crystal Maguire (Larter). What makes it interesting is there's history between them, and as a result, there is some degree of tension between them, in terms of tactics and methods, but together, they make a formidable team. They are supported and backed up by Maggie Pool [Tina Majorino]. Maggie is trained on every database you can imagine -- NSA, DOD, FBI. She is instrumental in creating the deep backstories of these legends, which becomes absolutely instrumental in many times saving Martin's life. Lastly, is Special Agent Tony Rice, played by Morris Chestnut. He is an agent who begins investigating a murder that he believes Sean's character may have committed. We're not actually sure because, when you do deep cover work and you're in these cases, often times, you're pushed into a situation, where you actually have to cross some moral lines that you wouldn't otherwise do. But Agent Rice doesn't believe that that's acceptable in the FBI. And so, he picks up the beginning of this investigation against Martin and discovers that there may, in fact, be more of a systemic corruption afoot in DCO. Along the way, he begins discovering the large conspiracy that underlines what's happening. Where is the Show Set: The DCO is based in Los Angeles, in the federal bureaucracy there. But as a federal agency, they go anywhere in the country and beyond. It's FBI, so it's predominately domestic, but they'll go where the stories take them. "Legends" will not only investigate cases in the United States. How Much Deviation is There From the Book: It's a completely different path. It's rooted in the novel's characters, but the demands of storytelling in a really good novel like Legends, and the demands of doing a TV show are totally different. Is There a New Identity Each Week: No. Each of Martin's deep-cover identities are actually pre-existing characters and pre-existing legends that are out there. They exist. They have their own apartments, their own cars, their own wardrobe, their own contacts, and their own friends. And so, as a case comes in to the FBI, and they turn to DCO to help investigate, Martin is an agent who can pick one of his pre-existing legends, not unlike a surgeon would pick an instrument. It's about: What is the best way that he can infiltrate? "Legends" premieres Wednesday, August 13 at 9 p.m. ET/PT on TNT.